Vaccine Illusion Due to the growing number of vaccine safety concerns, our society has been polarized into vaccine advocates and vaccine opponents. However, in the debate over vaccine safety, we have lost sight of a bigger problem: how vaccination campaigns wipe out our herd immunity and endanger the very young. 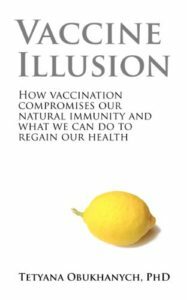 Written by an immunologist, Vaccine Illusion explains why vaccines cannot give us lasting immunity to infectious diseases and how they jeopardize our natural immunity and overall health. 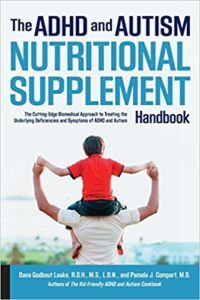 The ADHD and Autism Nutritional Supplement Handbook More than 90 percent of children diagnosed with ADHD or autism have nutritional or metabolic inefficiencies. Find out if your child is one of those suffering from this condition today, and learn how you can drastically improve your child’s symptoms and wellbeing with The ADHD and Autism Nutritional Supplement Handbook. In this groundbreaking new book, doctor-nutritionist team Pamela Compart, M.D. and Dana Laake, R.D.H., M.S., L.D.N., authors of the bestselling The Kid-Friendly ADHD and Autism Cookbook, reveal how to properly and safely implement supplements and dietary changes to affect and counter the symptoms of autism. Through their proven, symptom-by-symptom treatment method, you’ll learn exactly what regimens work best in helping your child’s brain and body thrive, resulting in improved behavior, attention, mood, language, cognition, and social interaction. 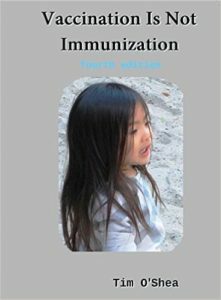 Vaccine Safety Manual is the worlds most complete guide to immunization risks and protection. It includes pertinent information on every major vaccine: polio, tetanus, MMR, hepatitis A, B, HPV, Hib, Flu, chickenpox, shingles, rotavirus, pneumococcal, meningococcal, RSV, DTaP, anthrax, smallpox, TB, and more. All of the information, including detailed vaccine safety and efficacy data, is written in an easy-to-understand format, yet includes more than 1,000 scientific citations. More than 100 charts, tables, graphs and illustrations supplement the text. This encyclopedic health manual is an important addition to every family’s home library and will be referred to again and again. Vaccine Epidemic. National polls show that Americans are increasingly concerned about vaccine safety and the right to make individual, informed choices together with their healthcare practitioners. Vaccine Epidemic focuses on the searing debate surrounding individual and parental vaccination choice in the United States. 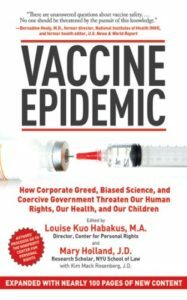 Featuring more than twenty experts from the fields of ethics, law, science, medicine, business, and history, Vaccine Epidemic urgently calls for reform. 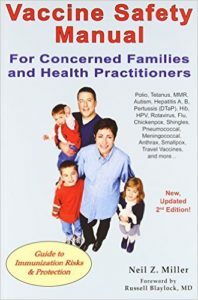 It is the essential handbook for the vaccination choice movement and required reading for all people contemplating vaccination for themselves and their children. Louise Kuo Habakus and Mary Holland edit and introduce a diverse array of interrelated topics concerning the explosive vaccine controversy, including: • The human right to vaccination choice • The ethics and constitutionality of vaccination mandates • Personal narratives of parents, children, and soldiers who have suffered vaccine injury • Vaccine safety science and evidence-based medicine • Corrupting conflicts of interest in the national vaccine program • What should parents do? A review of eight advice books on vaccines that span the gamut. 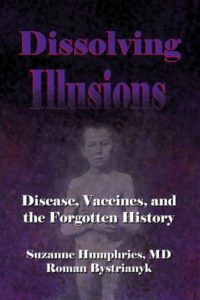 Dissolving Illusions: Disease, Vaccines, and The Forgotten History Not too long ago, lethal infections were feared in the Western world. Since that time, many countries have undergone a transformation from disease cesspools to much safer, healthier habitats. Starting in the mid-1800s, there was a steady drop in deaths from all infectious diseases, decreasing to relatively minor levels by the early 1900s. The history of that transformation involves famine, poverty, filth, lost cures, eugenicist doctrine, individual freedoms versus state might, protests and arrests over vaccine refusal, and much more. Today, we are told that medical interventions increased our lifespan and single-handedly prevented masses of deaths. But is this really true? Dissolving Illusions details facts and figures from long-overlooked medical journals, books, newspapers, and other sources. Using myth-shattering graphs, this book shows that vaccines, antibiotics, and other medical interventions are not responsible for the increase in lifespan and the decline in mortality from infectious diseases. If the medical profession could systematically misinterpret and ignore key historical information, the question must be asked, “What else is ignored and misinterpreted today?” Perhaps the best reason to know our history is so that the worst parts are never repeated. 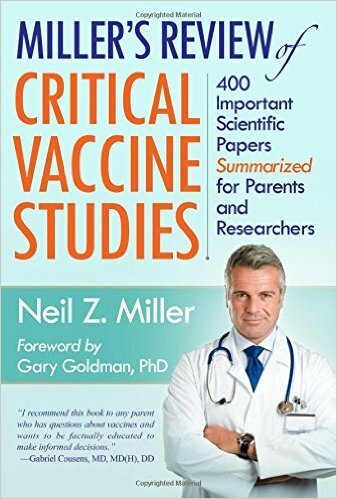 Miller’s Review of Critical Vaccine Studies: 400 Important Scientific Papers Summarized for Parents and Researchers Many people sincerely believe that all vaccines are safe, adverse reactions are rare, and no peer-reviewed scientific studies exist showing that vaccines can cause harm. This book ― Miller’s Review of Critical Vaccine Studies ― provides the other side of the story that is not commonly told. It contains summaries of 400 important scientific papers to help parents and researchers enhance their understanding of vaccinations. 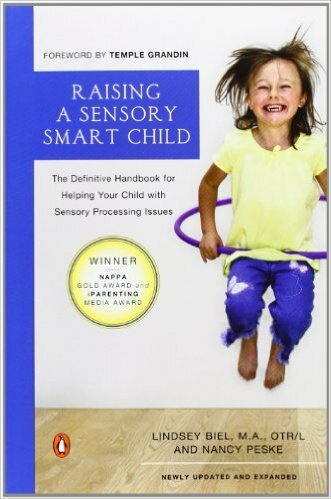 Raising a Sensory Smart Child: The Definitive Handbook for Helping Your Child with Sensory Processing Issues For children with sensory difficulties-those who struggle to process everyday sensations and exhibit unusual behaviors such as avoiding or seeking out touch, movement, sounds, and sights-this groundbreaking book is an invaluable resource. Sensory integration dysfunction, also known as sensory processing disorder, affects all kinds of children-from those with developmental delays, attention problems, or autism spectrum disorders, to those without any other issues. Coauthored by a pediatric occupational therapist and a parent of a child with sensory issues, this updated and expanded edition of Raising a Sensory Smart Child is comprehensive and more helpful than ever. Thimerosal: Let The Science Speak, by Robert F. Kennedy. In this groundbreaking book, Robert F. Kennedy, Jr., examines the research literature on Thimerosal and makes a very clear statement about its potentially dangerous effects. In the past, the CDC, FDA, NIH, and AAP, as well as the US Congress, the American Academy of Family Physicians, the US Department of Agriculture, the European Medicines Agency, and the California Environmental Protection Agency have expressed concerns over the use of Thimerosal in vaccines. But despite the many voices calling for action, the media and policy makers have repeatedly failed to adequately address the issue. 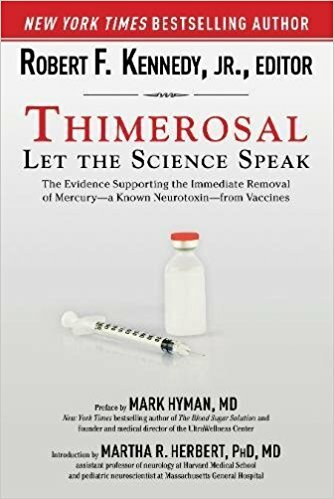 Now, with Thimerosal: Let the Science Speak, the science supporting the elimination of this toxic chemical from the world’s vaccine supplies, and its replacement with already available safer alternatives, is all in one place. Making this change should increase vaccination rates by restoring the trust of concerned parents in the vaccine program—a program that is so vitally important to public health.